As Wynn Macau's signature restaurant, Wing Lei is honored to be the recipient of the illustrious Michelin star for ten consecutive years, as well as the Five-Star Award from Forbes Travel Guide. Here you will enjoy the region's finest Cantonese dishes by executive chef Chan Tak Kwong; select from his extensive a la carte offerings or indulge in the ultimate Wing Lei experience, Chef Chan's Signature Menu. 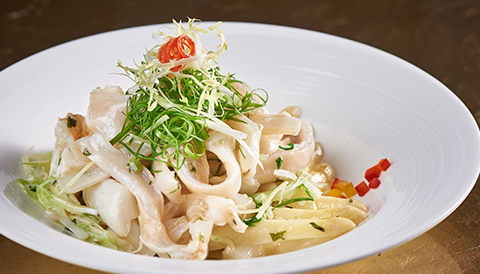 From tea-smoked crispy chicken to steamed Macau sole in soy sauce, Wing Lei showcases the traditions and flavors of exceptional Cantonese cuisine, and is an experience not to be missed. This dramatic space features five private dining rooms, each with its own oversized HD TV and private washroom, while in the main room, a dazzling crystal dragon has become an iconic design element of Wynn Macau.